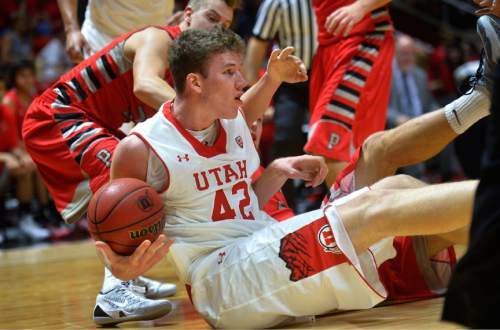 College basketball • Utah went continent-hopping to land Austrian teenager Jakob Poeltl, and he's making the transition to American courts look easy so far. 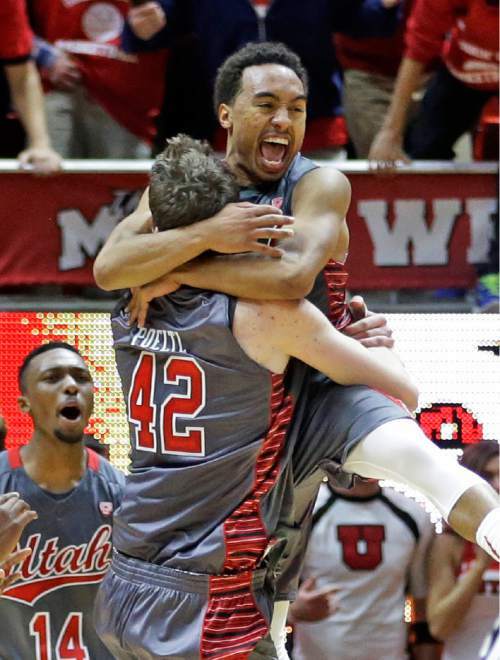 Utah guard Brandon Taylor, right, celebrates with forward Jakob Poeltl (42) following an NCAA college basketball game against Wichita State, Wednesday, Dec. 3, 2014, in Salt Lake City. Utah won 69-68 in overtime. (AP Photo/Rick Bowmer) Jakob Poeltl, University of Utah Men's Basketball Sept. 17, 2014 in Salt Lake City, UT. 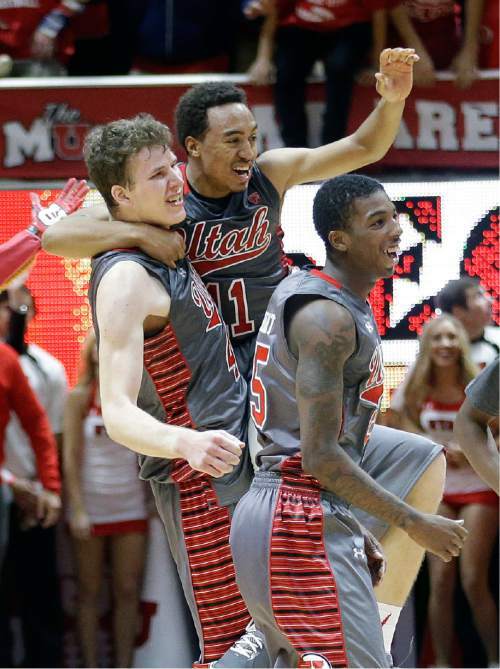 (Photo / Steve C. Wilson / University of Utah) Utah Brandon Taylor, center, celebrates with Jakob Poeltl (42) and Delon Wright following an NCAA college basketball game against Wichita State, Wednesday, Dec. 3, 2014, in Salt Lake City. Utah won 69-68. (AP Photo/Rick Bowmer) Utah guard Brandon Taylor, right, celebrates with forward Jakob Poeltl (42) following an NCAA college basketball game against Wichita State, Wednesday, Dec. 3, 2014, in Salt Lake City. Utah won 69-68 in overtime. 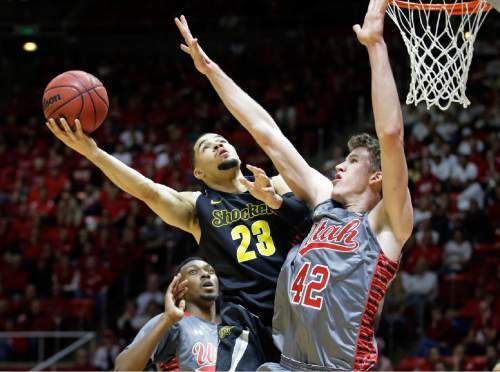 (AP Photo/Rick Bowmer) Wichita State guard Fred VanVleet (23) shoots as Utah forward Jakob Poeltl (42) defends in the second half of an NCAA college basketball game Wednesday, Dec. 3, 2014, in Salt Lake City. 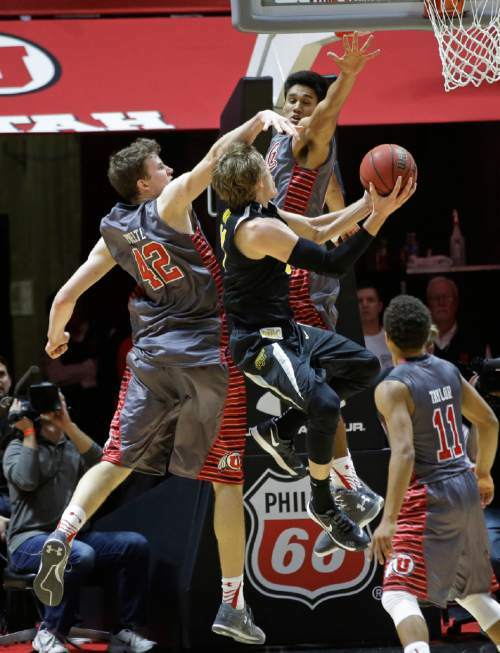 (AP Photo/Rick Bowmer) Wichita State guard Ron Baker, center, drives to the basket as Utah's Chris Reyes, rear, and Jakob Poeltl (42) defend in overtime during an NCAA college basketball game Wednesday, Dec. 3, 2014, in Salt Lake City. Utah won 69-68. 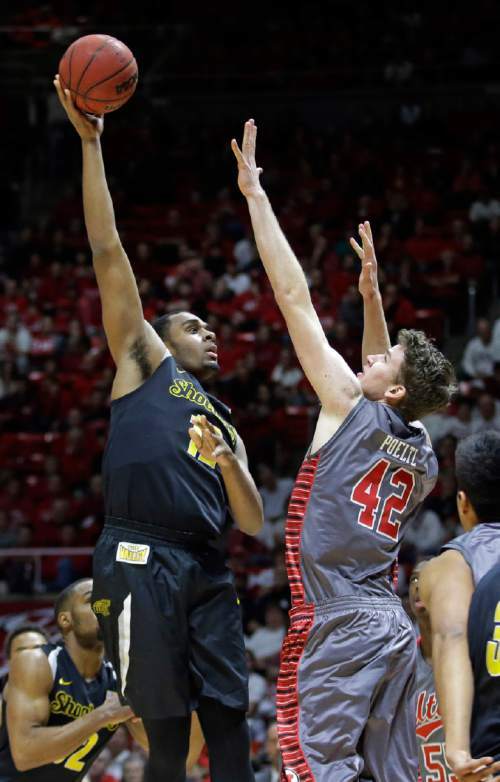 (AP Photo/Rick Bowmer) Wichita State forward Darius Carter (12) shoots as Utah forward Jakob Poeltl (42) defends in the second half of an NCAA college basketball game Wednesday, Dec. 3, 2014, in Salt Lake City. 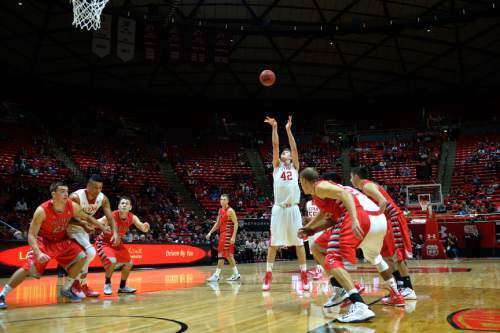 (AP Photo/Rick Bowmer) Chris Detrick | The Salt Lake Tribune Utah Utes forward Jakob Poeltl (42) shoots a free throw during the game at the Huntsman Center Thursday November 6, 2014. Chris Detrick | The Salt Lake Tribune Utah Utes forward Jakob Poeltl (42) is introduced during the game at the Huntsman Center Thursday November 6, 2014. Chris Detrick | The Salt Lake Tribune Utah Utes forward Jakob Poeltl (42) and Pacific Boxers Coby Proctor (2) go for the ball during the game at the Huntsman Center Thursday November 6, 2014. Leah Hogsten | The Salt Lake Tribune Utah Utes forward Jakob Poeltl (42) dunks against Ball State during the first half of the Utes' home opener at the Jon M. Huntsman Center in Salt Lake City, November 14, 2014. Leah Hogsten | The Salt Lake Tribune Utah Utes forward Jakob Poeltl (42) is fouled by the hand of UC Riverside Highlanders forward Taylor Johns (5) (right) and blocked by UC Riverside Highlanders forward Alex Larsson (21). 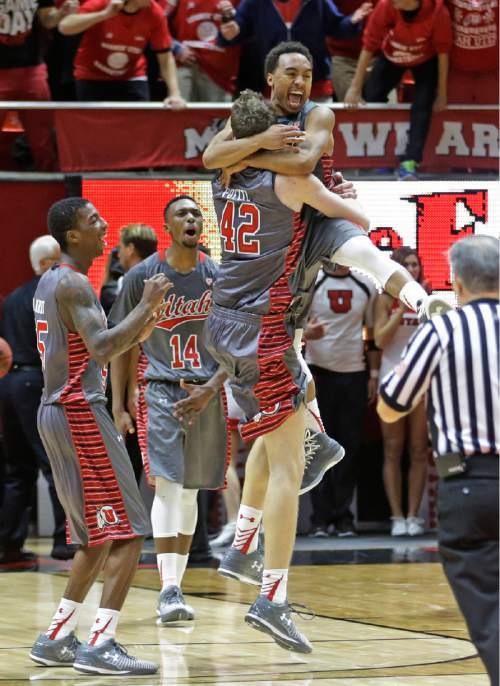 The University of Utah defeated the UC Riverside Highlanders, 88-42, November 21, 2014, at the Jon M. Huntsman Center. 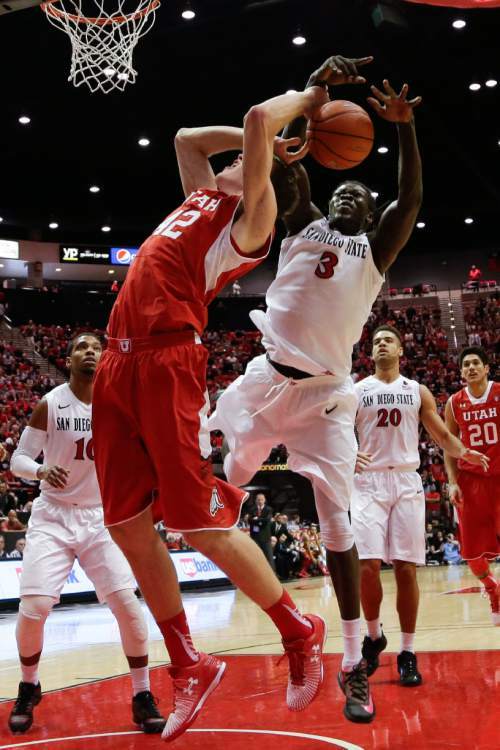 Utah forward Jakob Poeltl is fouled by San Diego State forward Angelo Chol (3) during the first half in an NCAA college basketball game Tuesday, Nov. 18, 2014, in San Diego. (AP Photo/Gregory Bull) San Diego State forward Skylar Spencer (0) blocks a shot by Utah forward Jakob Poeltl during the first half of an NCAA college basketball game Tuesday, Nov. 18, 2014, in San Diego. (AP Photo/Gregory Bull) Trent Nelson | The Salt Lake Tribune Utah Utes forward Jakob Poeltl (42) blocks a shot by Wichita State Shockers guard Fred VanVleet (23) as the University of Utah Utes host the Wichita State Shockers, college basketball at the Huntsman Center in Salt Lake City, Wednesday December 3, 2014. 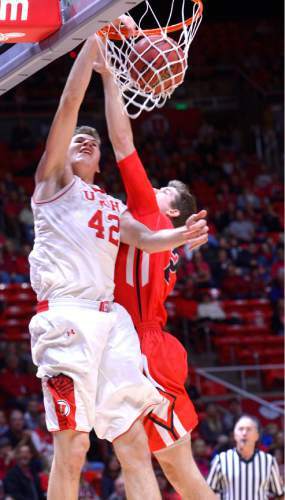 Utah Utes forward Chris Reyes (20) at right. A coach&apos;s presence in a recruit&apos;s home is a powerful tool. Even more so when he has flown 5,500 miles to get there. 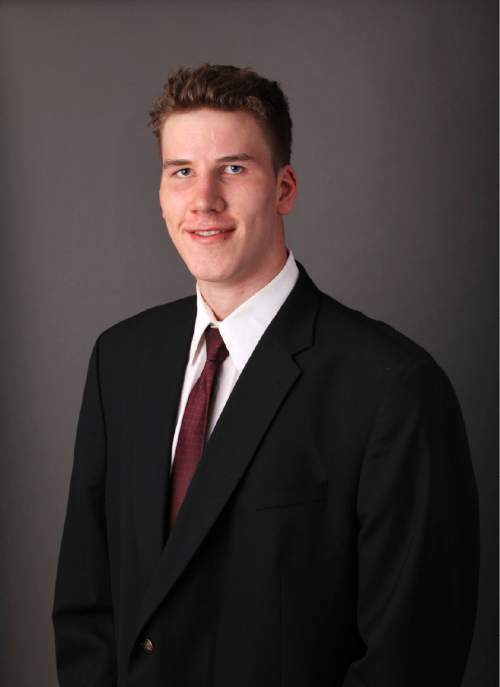 Meeting Larry Krystkowiak once was a big deal for Jakob Poeltl. Only two NCAA head coaches had come to visit him in Vienna, Austria: from Davidson and Utah. But it was the second visit  when Krystkowiak picked him up from school and they talked over lunch  that really sealed the U. as the 7-foot center&apos;s college destination. "It meant a lot, that was one of the main reasons I came here," he said. "That&apos;s a pretty long flight so I figured they really wanted me, and they will take care of me." At the time, Krystkowiak&apos;s two visits to Austria were a pricey sell  it&apos;s quite a hit on the recruiting budget to fly twice to Europe. Now those trips look like a bargain. Poeltl, 19, is averaging nearly a double-double (12.3 points, 9.6 rebounds) and is a game-changer on both ends of the floor. On the attack, he can gobble up rebounds and put them back, and any pick-and-roll tandem featuring him is tough to stop. Getting back on defense, his physicality and instincts for coverage are a good pairing with his exceptional reach, making for a shot-blocking phenom. Poeltl (pronounced Pur-tle) was a virtual unknown while playing in Austria; try finding a YouTube clip of him dated before October. Now, only seven games into his college career, he&apos;s already showing up on NBA draft boards as a potential first-rounder. While Utah didn&apos;t know Poeltl would be this good this quickly, there were hints  enough of them to set off a continent-hopping pursuit. "It&apos;s not an extreme kind of statement, not &apos;I&apos;m not surprised&apos; or &apos;I&apos;m blown away,&apos;" Krystkowiak said. "But at the end of the day, it&apos;s kind of what you wished for and I&apos;m kind of not surprised, because we saw some of those skills." Poeltl wasn&apos;t exactly a secret. Other schools recruited him, and he went on official visits to Cal and Arizona. It was hard to miss him, in fact, when Utah first spotted him blocking shots at the U18 European Championships in Macedonia  a competition where he eventually landed on the all-tournament second team. There were a lot of good players there, but assistant Andy Hill said Poeltl seemed to be special. "Just his rebounding and his physicality, the athleticism you can see," he said. "Being a young big man, they sometimes shy away from contact. Jakob doesn&apos;t mind that." He didn&apos;t shy away from the rough stuff, either, while playing for the Arkadia Traiskirchen Lions last year in Austria&apos;s top basketball league, the Bundesliga. Poeltl didn&apos;t get paid, in order to maintain his college eligibility, but he shot 75 percent and averaged 12.7 points and 7.7 rebounds against men in their 20s and 30s. 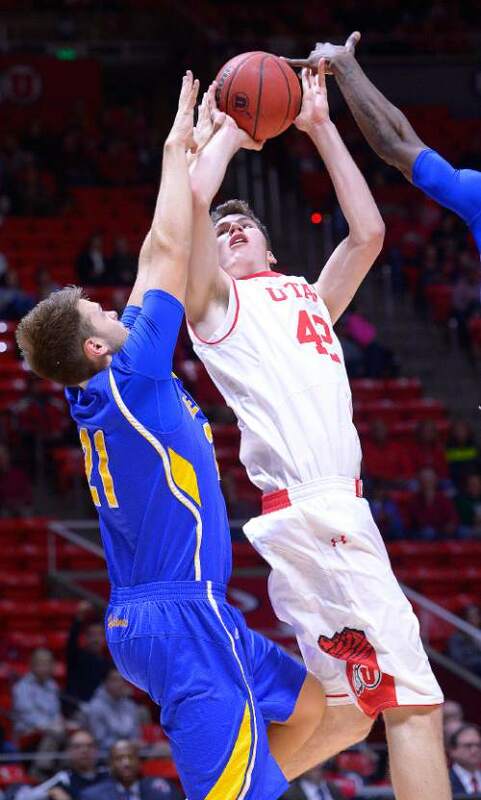 The Utes were willing to bet that Poeltl would adapt well to the American college system. He was fluent in English, and he was already going to school at 8 in the morning and not coming home until after practice at 10 or 11 at night by bus or train, "some pretty hard days" as Poeltl called them. "He was burning the oil at both ends," Krystkowiak said. "I always thought recruiting him, even talking to him and his family, I thought when he got in the college environment where everything is self-contained … that he would have a chance to flourish." So Krystkowiak went over to get him. The first time, the coach brought his wife, Jan, to meet with Poeltl and his family. The second time, it was just him. Before each trip, Krystkowiak met with athletic director Chris Hill to get approval for the travel. The budget for such long, costly journeys comes through donations from longtime Utah booster and arena namesake Jon M. Huntsman, according to Hill. "That&apos;s the one area of the budget that we&apos;re flexible on, if [the coaches] have somebody that&apos;s really, really special," Hill said. "Larry said he wanted to give everything he could to recruit this kid. We&apos;re fortunate we have that, and it&apos;s nice to have supporters who give us that." 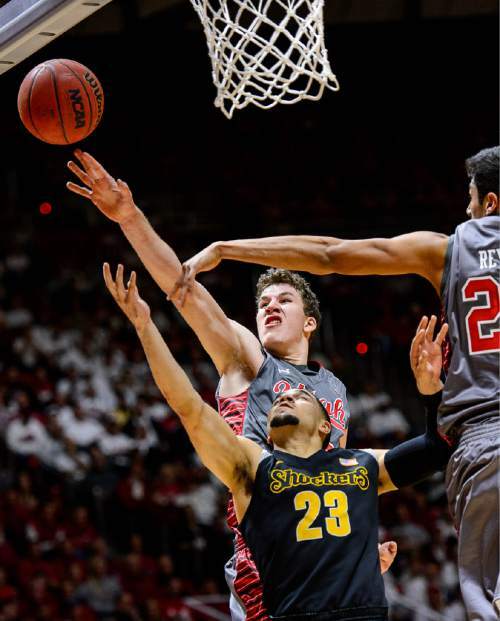 In coming to Utah, Poeltl had to weigh the consequences of leaving behind his family and friends, and the chance to play professionally in Europe. But his eventual goal is to play in the NBA, and Krystkowiak&apos;s experience in the league as a player and coach appealed to him. He also got the sense Utah would give him a lot of personal attention in practice, that they wouldn&apos;t "forget" about him. "He said he&apos;s gonna try to develop me into the player I can be, to reach my full potential," Poeltl said of the Ute coach. "And that they were going to take care of me out here." Krystkowiak wasn&apos;t the only recruiter working for Utah. 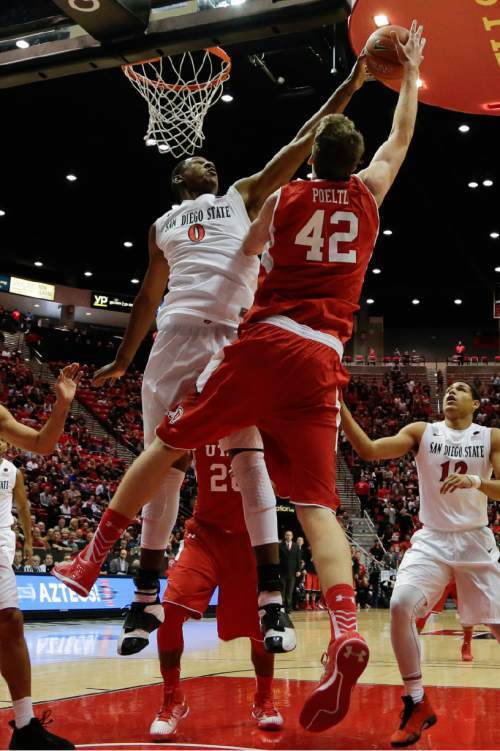 After his freshman season in Utah, German native Kenneth Ogbe was messaging Poeltl to convince him to come west. 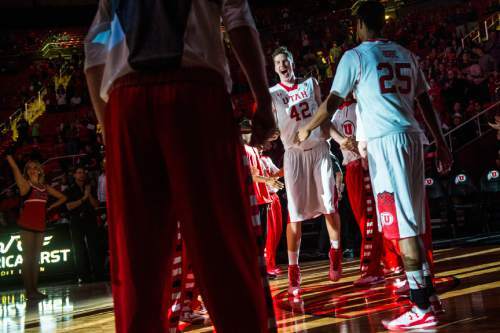 If anyone saw Poeltl&apos;s potential for success first in Utah&apos;s program, it was Ogbe. "I knew how good he was," he said. "We actually played two or three games together on one team. He was only 15. You can just tell how talented and how good he is. He was just blocking every shot. He&apos;s so long." Since Poeltl came to the United States, he&apos;s been roommates with Ogbe and Chris Reyes. The two Europeans are best friends: When you speak in a foreign tongue all day, both said, it&apos;s relaxing to have a fellow German speaker around to talk to. Ogbe helped Poeltl survive his initial introduction to America and Utah. The center acknowledged he had "no clue" what was going on at times. Ogbe introduced him to Siegfried&apos;s Deli downtown, where the two often go to chow down on schnitzel and bratkertoffen. Poeltl has also helped Ogbe in other important life skills: mainly video games. "We play a lot of FIFA, that&apos;s what we do," Ogbe said. "I wasn&apos;t very good at FIFA. Jakob came, and he showed me some tricks, and I&apos;m pretty good now. I&apos;ve beaten him a couple of times." Poeltl is also pretty tough to beat on the court, where he quickly ascended to a starting role at the beginning of the season. But far from possessing a prima donna attitude, teammates say he&apos;s humble, goofy even. It&apos;s easy to imagine him having taken the other route Europeans can take. If Poeltl had gone pro, he&apos;d probably be making a lot of money somewhere closer to home. But he said he wasn&apos;t interested in taking that leap, not yet. "I wanted to get an education, not go pro immediately after high school. I don&apos;t think that would be possible to go pro and still go to university," he said. "I imagine pro ball as a rough business, and I think college is like the step in between to kind of prepare for it." If he wasn&apos;t sure how he might adapt before to college ball, Poeltl knows now. He&apos;s heard some of the chatter about his gifts, about the millions he could make, even as soon as next year if the season goes well. Good showings against San Diego State and Wichita State have scouts wondering how soon he might decide to take a shot at the NBA. Poeltl said doesn&apos;t know the answer to that question yet. And he&apos;s perfectly content to let it remain unanswered for the time being. The Utes are the ones who went after him when he was an enigma, and for now, the Utes are his team. "Before I got here, I was thinking I&apos;d stay more than one year, but I&apos;ll have to see how the season goes, and then I&apos;ll decide on that," he said. " I really don&apos;t try to think about it now because we have the season going on. I think I have enough time to think about it after the season."